If you’ve read my last review of a Barbie movie, you’ll know that I’m not the greatest fan of the series, although my girls most certainly are. And since they, not I, are the target audience for these animated tales, I guess my opinion doesn’t really count for that much – far less than theirs anyway. It was with a little trepidation, then, that I sat down to watch the latest movie, Barbie and the Secret Door. Released on DVD on September 1st, the movie sees Barbie cast as a princess (but of course!) called Alexa, who lacks confidence in herself, and avoids as much social interaction as she can get away with. Things change, though, when her grandmother gives her a special book which reveals and unlocks a secret door, leading to another, more magical kingdom. And it’s in this second kingdom that the bulk of the action takes place, as Alexa battles to free it from Malucia, a mean and nasty princess who’s stealing magic from fairies, mermaids and even unicorns to make herself more powerful. Throw in no fewer than seven all-new songs, and it was almost inevitable that the girls would enjoy it. Heather gave it 11 out of 11 which, unknowing Spinal Tap reference aside, is as good as it could get, and Megan loved it too. Every time they’ve watched it. Here’s the strange thing though – I enjoyed it too! Yes, the story was a bit predictable, but to adult eyes most films aimed at kids are, so it would be unfair to knock it for that. Predictability aside though, this actually had a lot going for it. The songs, although not in the same league as those from Frozen, were catchy, and fitted well within the structure of the movie. They were also spread fairly evenly throughout, unlike Frozen which seemed determined to get the musical numbers out of the way as soon as possible. The animation – something I’ve very hit and miss in previous Barbie movies – was pretty good, and had more than a nod to Dr Seuss in the magical kingdom, both in the characters and its landscape. Not a bad thing in my book. I also really liked the “villainous” Malucia, particularly the scene where we are first introduced to her – that got an actual out loud laugh from me! All in all, this is definitely one of the better Barbie movies I’ve seen, and not one I’d try desperately to dissuade the kids from watching again. Which, if you’ve seen some of the older ones, you’ll know is high praise indeed! 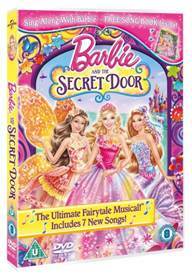 Barbie and the Secret Door is available to buy on DVD from 1st September 2014. This autumn I'm running/cycling in a 30km duathlon and a half marathon, to raise money for Breast Cancer Campaign. You can read more about my challenge here or support me here. All donations, however big or small, gratefully received! Hi! I'm Richy, husband to Gemma, daddy to Heather and Megan, IT worker, music fan, sports fan, geek. This is my blog - thanks for stopping by!